This Sunday, February 2, more people will be glued to their TV sets than any other time of the year. Super Bowl LIII is expected to outperform Super Bowl LII, which drew in over 103.4 million TV viewers and 170.7 million social media interactions (Source: Nielson). Whether you’re watching to see “Tom vs. Time”, McVay vs. Belichick, the chicken wings or the commercials, it is the TV event of the year and few miss out. For those interested in actually watching the game, in the 2019 Super Bowl, the St. Louis Rams (+2.5) will take on the New England Patriots (-2.5). 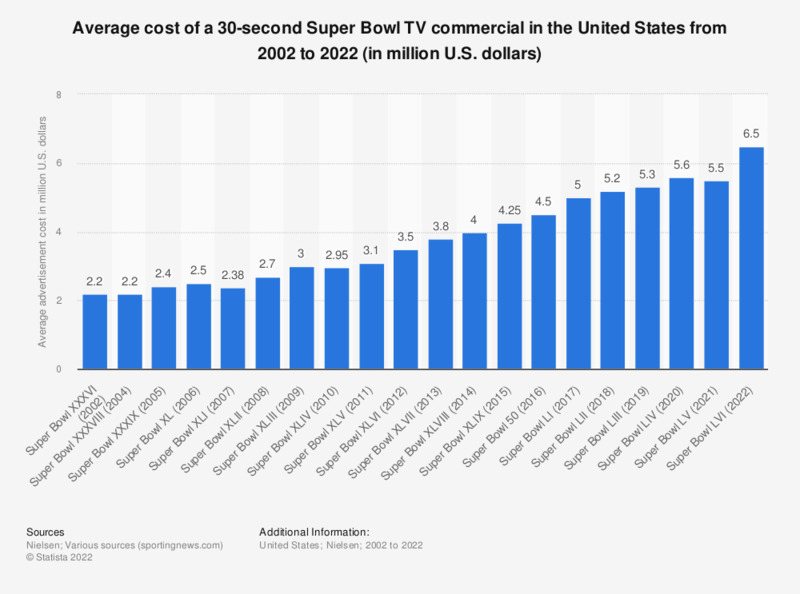 CBS, this year’s Super Bowl broadcasting network, is charging a jaw dropping $5 million per 30-second spot, which is only about $1 million more than spots during the 2014 game (Source: CNBC). And I’m pretty confident no one is going to be able to negotiate down those rates, regardless of the media buyer. InBev has reportedly covered all of the bases with ads for their brands, including Budweiser, Bud Light, Michelob Ultra, Stella, and Bon & Viv Spiked Seltzer (sorry White Claw). In total, they are buying up a record six-and-a-half minutes of advertising time, which comes out to about $34 million. After selling a benchmark 100 million units sold, Amazon has recommitted to using star personalities in their Super Bowl commercials. For all the kids out there, the guy chasing after the dog is Harrison Ford. If you aren’t familiar with his work, check out a little-known saga called Star Wars and get back to us. For the record, I would totally get an Alexa hot tub from Northeast Factory Direct. InBev got creative with this one. The spot was informative, while still be creative. The tie in Shark Tank was just a nice touch. bubly (points for using all lower case in the name) could have gone with a whole list of people the Great White North: Jim Carrey, Ryan Gosling, Drake, Ryan Reynolds… But using Michael Bublé is just too perfect. As far as classic Budweiser commercials go, this checks all the boxes – Dog (check), Clydales (check), country music (check), ‘Meric (check). Add in a little corporate social responsibility and you’ve got yourself another staple commercial from the King of Beers during the game of the year. Wait, is Serena Williams in a spot for the social dating app? What she’s saying is great. Does it have anything to do with Bumble, I’m not really sure. We’ll just have to wait and find out if #InHerCourt starts trending come halftime. If the Burger Kind MYSTERY BOX doesn’t sell out, the only reason is this it doesn’t have a Classic Chicken Sandwich in it, which basically makes it irrelevant. In all seriousness, wow. BK found a way to get a message our piece of unique creative that literally says nothing, well played. If other brands knew this spot was going to run, I would like to think they would have just not even bothered. Doritos has produced some of the more memorable commercials over the years. With everything from Morgan Freeman and Game of Thrones Peter Dinklage to the “Free Doritos” campaign, the company has delivered time and again. No matter how much went into convincing a rapper that he should create a full music video for an accounting service, accounting still isn’t cool. The company begins to describe their products as, “When you live the life of a baller like 2 Chainz, you’ve got better things to do than collect receipts and fill out spreadsheets.” you have to wonder what the good people who decide GAAP think about this. For anyone that has been watching NFL football this year, you’ve probably been as confused about that the first teaser spot Microsoft has been running all season was leading to as much as Sean Peyton was wondering what constitutes pass interference in a Conference Championship game. Well, now we know. Steve Carell, Lil Jon, and Cardi B walk into a diner… Looking at the bigger pictures, Pepsi is actually much more than OK. Pepsi actually managed the upset of the year. They managed to have go into Atlanta, literally Coca-Cola’s backyard, and take over the city. Let’s not mention that fact that Coke, a massive player in the Atlanta Sports Council, put millions into bringing the Super Bowl to Mercedes Benz stadium. 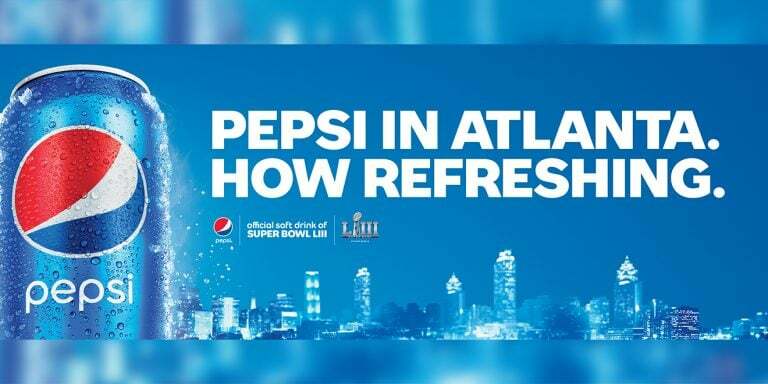 Now, Coke is being replaced throughout the stadium and at ever official Super Bowl even for the official league drink, Pepsi. This is not a comprehensive list of the ads to come. You’ll just have to wait until the Big Game for that. Be sure to be on the lookout for “The Dude” (Jeff Bridges), Luke Wilson, Alex Rodriguez, Christina Appelgate, and Jason Bateman. Whatever the reason you watch the Super Bowl, this year is probably going to give you plenty to talk about. From the Super Bowl Ads to the play on the field, just remember, nothing will ever top the greatest Super Bowl Ad of all time.